The Intel® Ultimate N WiFi Link 5300 series is a family of IEEE 802.11a/b/g/Draft-N1 wireless network adapters that operate in both the 2.4 GHz and 5.0 GHz spectra. These adapters, available in both PCIe* mini-card and half mini-card form factor deliver up to 450 Mbps of bandwidth; in addition to providing a host of ...features that enhance today’s mobile lifestyle. 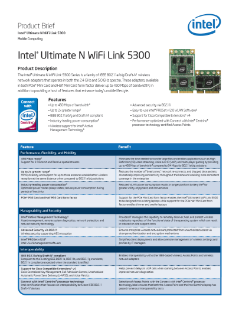 Read the full Intel® Ultimate N WiFi Link 5300 Product Brief.